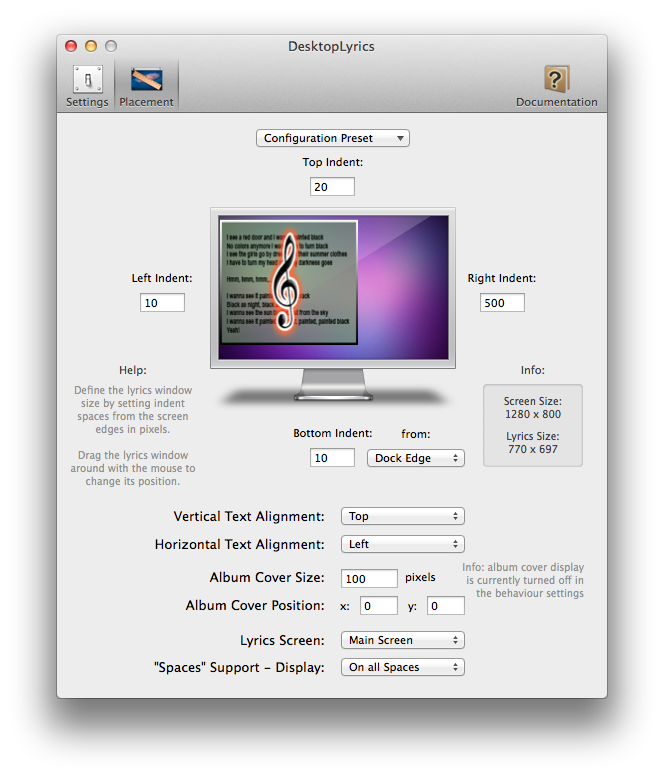 DesktopLyrics is an application that displays the lyrics of the song currently playing in "iTunes" right on your desktop. The lyrics for the song have to be set in iTunes, DesktopLyrics does nothing to fetch lyrics if they aren't available in iTunes. 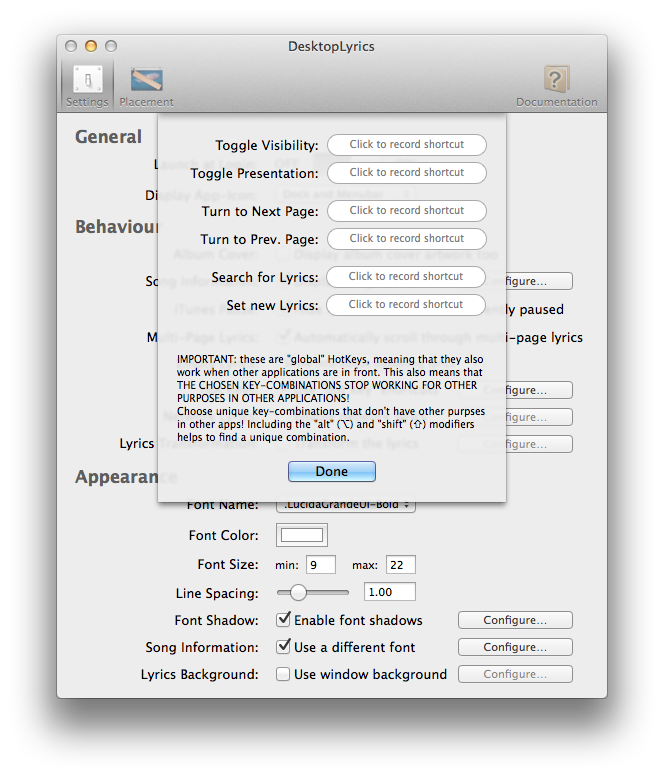 If you don't want to type-in all your lyrics manually you can use applications like "iFetchLyrics", "Get Lyrical" or "Lyrics Finder". LYRICS DISPLAY: DesktopLyrics does not only display the lyrics but can also display the information about the current song (e.g. title) in a customizable manner. Additionally, you can opt to display the artwork of the song too. DesktopLyrics allows you to define the font, size, color and shadows for the lyrics and for the song-information separately, so that the lyrics exactly match your taste and desktop picture. 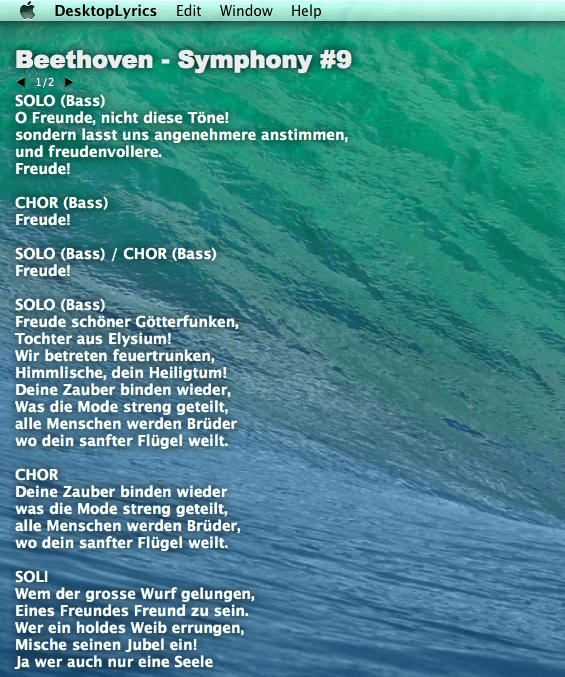 PAGE SYSTEM: Long lyrics that can't be displayed at once are automatically cut into multiple "pages". You can turn the pages with small buttons embedded into the lyrics display, turn them with hot-key combinations or just have them turned automatically. There is an advanced option for defining the time-code of the page turning. 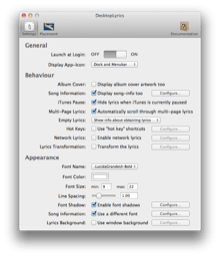 NETWORK LYRICS: You can also display the lyrics of the music playing on your Mac on several other Macs, iPhones and iPads. LYRICS SHARING: DesktopLyrics features options to share the current lyrics with your friends by e-mail or by posting them to FaceBook or Twitter. You can also copy them to the clipboard or printing the lyrics. EXTENSIVE OPTIONS: In addition to the exhaustive settings to customize the lyrics appearance, DesktopLyrics also features a host of options to change its behavior to be as practical as possible. 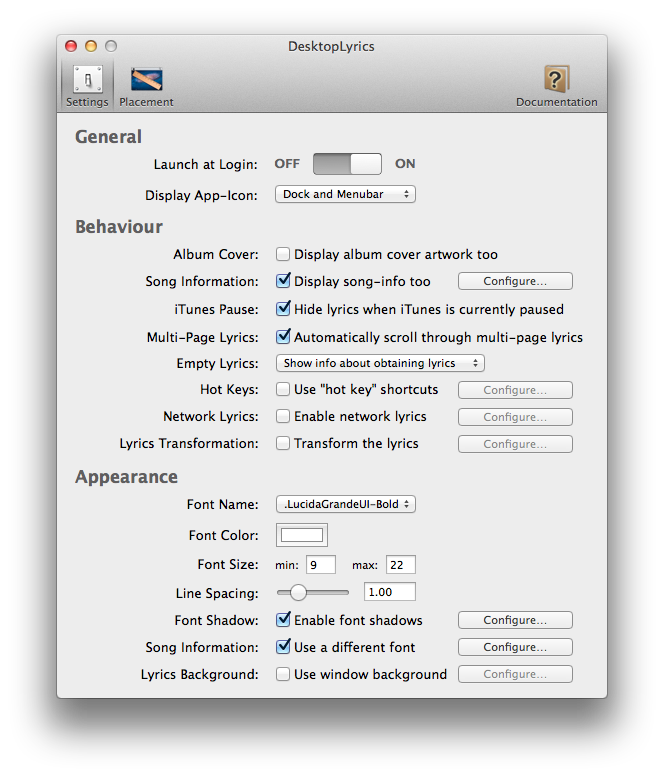 You can display DesktopLyrics in the menubar instead of the Dock, use hot-key combinations to operate it, or change the behavior in case iTunes is paused or the lyrics are empty. Additionally you easily search the internet for missing lyrics, use "Python" scripts to post-process the lyrics to your liking (e.g. to clean or translate them), toggle the lyrics visibility on-the-fly or use the convenient 'presentation-mode' which hides other apps to focus on the lyrics. 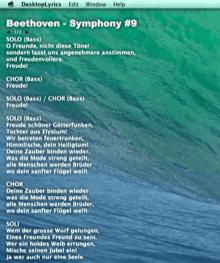 DesktopLyrics is licensed under a proprietary license and costs 6.99$. Technical support is available only from within DesktopLyrics (in the "Documentation" tab).